Papal Etiquette: What to Do If You Meet the Pontiff If you get a chance to meet Pope Benedict XVI during his visit to the U.S., how should you act? Monsignor K. Bartholomew Smith, who knew the pope back when he was a cardinal, offers some advice. 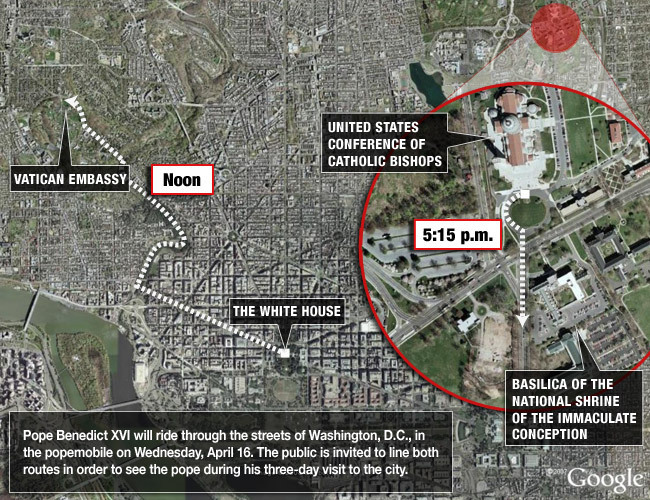 The Pope's Route in D.C.: The public is invited to line up along these two mapped routes Wednesday to see Pope Benedict XVI ride in his popemobile through the streets of Washington, D.C. 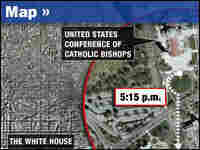 If you get a chance to meet Pope Benedict XVI during his visit to the U.S., how should you act? NPR asked Monsignor K. Bartholomew Smith. Smith knew Pope Benedict XVI back when he was Cardinal Joseph Ratzinger and has met the pontiff a few times since Benedict ascended to the papacy three years ago. If you are invited to an audience with the pope or will be attending an event where he'll be present, this is a time to put on your best, says Smith. For men, that means a jacket and tie and polished shoes. For women, a nice dress or suit works best — preferably one that covers the arms and has a hemline below the knees. But Smith says if you're going to one of the stadium Masses or gathering along the popemobile route, leave your high heels at home and feel free to wear your favorite baseball cap. Casual dress is just fine. What do I do when the pope enters? Stand and applaud, the monsignor says. He says applause for the pope often varies according to the type and place of the event. In a small room, people often clap quietly, as if they were at a golf tournament. 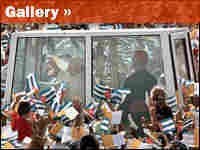 But in a big venue, such as a stadium, the crowd frequently greets the pope with loud cheers and a thunderous ovation. You're welcome to join in. What if the pope approaches me? Don't just stand there — genuflect. That means bend at the knee, for you non-Catholics. Do I kiss the ring? Yes, if you are Catholic and the pope offers his hand. If you're not Catholic, you can opt to shake his hand. That's what President Bush did on Tuesday when he met the pope at Andrews Air Force Base outside of Washington, D.C. The ring is a mark of the papacy and, according to Smith, kissing it is a sign of respect and affection. What do I call the pope? Address him as "Your Holiness" or "Holy Father." Introduce yourself and tell him something about you. Decide in advance what you're going to say, but let him lead the conversation. Keep your answers short and direct. And speak clearly. Smith says sometimes people are so nervous, they whisper. Make sure the pope can hear you. When the pope gets up to leave, you should also stand up. Wait for him to leave the room before turning your attention to anything else. Smith says Pope Benedict is a warm and humble man, who tries to make people comfortable in his presence. "You've got to be very careful if you introduce yourself to him," says Smith, "because he's very likely to remember."